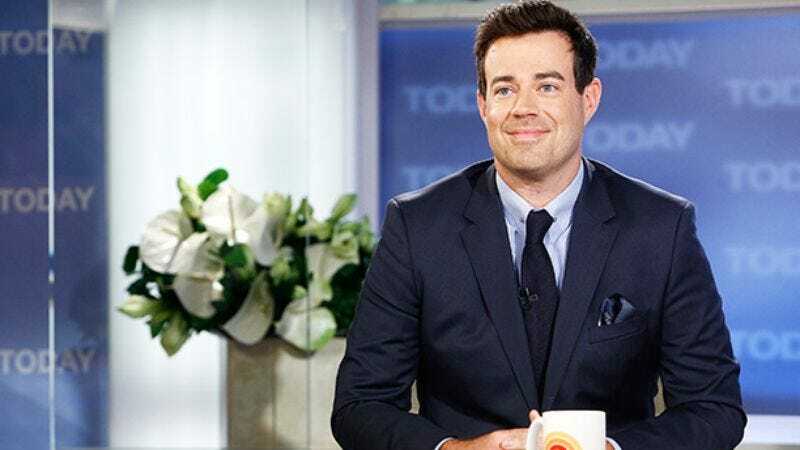 Demanding another anchor to come and provide a younger, hipper balance to Matt Lauer, NBC has hired 40-year-old stripling Carson Daly, taking away his late-night Last Call hosting duties and rousting him out of bed for Today, at an hour when responsible adults get up and go to work for a living, as it’s high time Carson Daly learned a little responsibility. Daly will join Today on Sept. 16, where he will debut alongside the show’s new open floor plan, which is all the better for skateboarding and other young people things. Among them: Social media-ing, which Daly will oversee as the host of Today’s new “Orange Room," which NBC describes in its press release as a “first-of-its-kind digital studio” that—despite sounding very intimidating and austere, what with the word “digital” in there—is really more of a “casual, lounge-like setting,” as all things are when described by desperate marketing managers. Much as he once served as the cool substitute teacher who lets you chew gum on Total Request Live, treading to keep above the roiling hormonal donnybrook and manning old-fashioned telephone lines, Daly will now do that with Internet things, in a casual, lounge-like setting. The Orange You Glad You Can Just Chill Out For A Mo’ With Carson Daly Room is described as a “hub of emerging technology, equipped for everything from social media hangouts, to extended live-stream interviews with Today guests, analysis of real-time social data and reactions from the web, as well as the home for Today's original digital franchises.” Daly is further described as “the bridge between viewers and the show” who’s trapped within that hub, a digital Charon consigned to ferry your tweets across the social media river Styx to the waiting chasm of Matt Lauer’s emotions, where they will be slowly torn asunder. Picture the movie Tron. Now picture Carson Daly trapped inside Tron, but just kind of casually lounging. Now tweet at him about it, so he can briefly feel the kiss of the open sky he once knew so well, before he became one with The Orange. With Daly now consigned to spend his days fighting Facebook commenters to the death in the Tweeterdome, an announcement is said to be forthcoming about who, if anyone, will take over his Last Call hosting duties. In the meantime he’ll remain on as its executive producer, texting suggestions and distress calls to the show whenever Matt Lauer looks away.